GAZA CITY, Gaza Strip -- Israeli forces clashed with Palestinian demonstrators along the Gaza border on Friday, killing five of them, as a rash of stabbing attacks in Israel and the Palestinian territories, including the first apparent revenge attack by an Israeli, raised fears of wider unrest. Recent days have seen a string of attacks by young Palestinians with no known links to armed groups who have targeted Israeli soldiers and civilians at random, complicating Israeli efforts to contain the violence, which has been linked to tensions over a sensitive Jerusalem holy site. 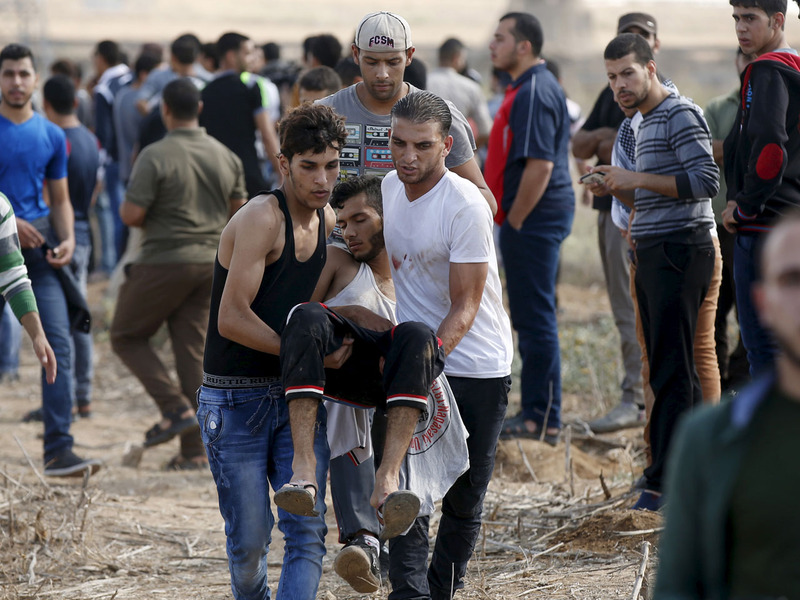 The violence spread to Gaza on Friday, with five Palestinians killed during clashes between stone-throwers and Israeli forces along the heavily guarded border, according to the Gaza Health Ministry. The border had been largely quiet following last summer's war between Israel and the Islamic militant group Hamas, which rules the territory. The Israeli military said about 200 Palestinians in Gaza advanced toward the border, throwing rocks and rolling burning tires at troops stationed there. It said that forces opened fire at the main instigators to stop their advance. Gaza-based Hamas leader Ismail Haniyeh meanwhile applauded the recent Palestinian stabbing attacks across Israel at a speech in Gaza, calling the surge in violence an intifada, or uprising. The attacks were initially confined to east Jerusalem, where the holy site is located and the West Bank - both territories captured by Israel from Jordan in the 1967 war and claimed by the Palestinians for their future state. But over the past week the violence has spread to Tel Aviv and other Israeli cities. In Jerusalem, a Palestinian wielding a vegetable peeler stabbed and wounded a 14-year-old Israeli on Friday before being arrested. In another attack near the entrance of Kiryat Arba, a West Bank settlement, a Palestinian was shot dead by a police officer after he attacked the officer with a knife and tried to seize his weapon, police said. In northern Israel, a 29-year-old Arab-Israeli woman was shot and wounded while attempting to stab people at a bus station in the town of Afula, where another stabbing had taken place the day before, police said. Video footage of the incident surfaced online, showing the woman surrounded by several members of the security forces, pointing their weapons at her and yelling. Her right arm makes downward gestures with a long shiny object that police said was a knife. At one point, a member of the security forces rushes forward, shots ring out and the woman falls to the ground. It's not clear from the footage what she was doing at the exact moment she was shot. Police said she posed an "immediate threat." In what appeared to be the first revenge attack amid the wave of violence, an Israeli man stabbed and wounded four Arabs in the southern Israeli city of Dimona, police spokeswoman Luba Samri said. After his arrest, the stabber said he carried out the attacks in retaliation for the numerous Palestinian attacks, Israeli media reported. Dimona mayor Beni Bitton said the stabber is a "mentally ill man." He told Channel 10 TV that two of the victims worked for City Hall, and that passers-by quickly rushed to provide first aid to the wounded Arabs. Prime Minister Benjamin Netanyahu "strongly condemned the harming of innocent Arabs," saying that anyone who resorts to violence will be brought to justice. Four Palestinians have been killed while carrying out attacks against Israelis over the past week, while another three Palestinians were killed in protests and clashes in the West Bank. The Red Crescent medical service says over 500 Palestinians have been wounded in violent protests in the West Bank since the weekend, including about 100 from live fire. Last week Palestinians shot two Israelis to death in front of their children in the West Bank and in a separate attack killed two Israeli men and wounded a mother and toddler in Jerusalem. The attacks have shocked Israelis and sparked fears of a new Palestinian uprising like those of the 1980s and 2000s. However Israeli officials have downplayed that possibility, saying Israel has seen similar spikes in violence in the past. In Jerusalem, Israeli security forces braced for more unrest, barring Palestinian men under the age of 45 from the holy site at the heart of the recent tensions, which Muslims refer to as the Noble Sanctuary and Jews refer to as the Temple Mount. The hilltop religious site is a frequent flashpoint and its fate is a core issue at the heart of the Israeli-Palestinian conflict. It is known to Jews as the Temple Mount, site of the two biblical Jewish temples. Muslims revere it as the Noble Sanctuary, where they believe the Prophet Muhammad ascended to heaven. Non-Muslim visitors are only allowed to enter the site at specific hours and are banned by police from praying there. Many Muslims view these visits as a provocation and accuse Jewish extremists of plotting to take over the site. Israel has promised to ensure the delicate arrangement at the site and insists it will not allow the status quo to be changed. But in the last two months, Israel has intermittently restricted some Muslims from the compound when Jews visit. Israel says this is to reduce friction, but Palestinians claim that Israel intends to establish Muslim-free Jewish visiting hours. The site is so sensitive that even rumors are enough to trigger violence there.